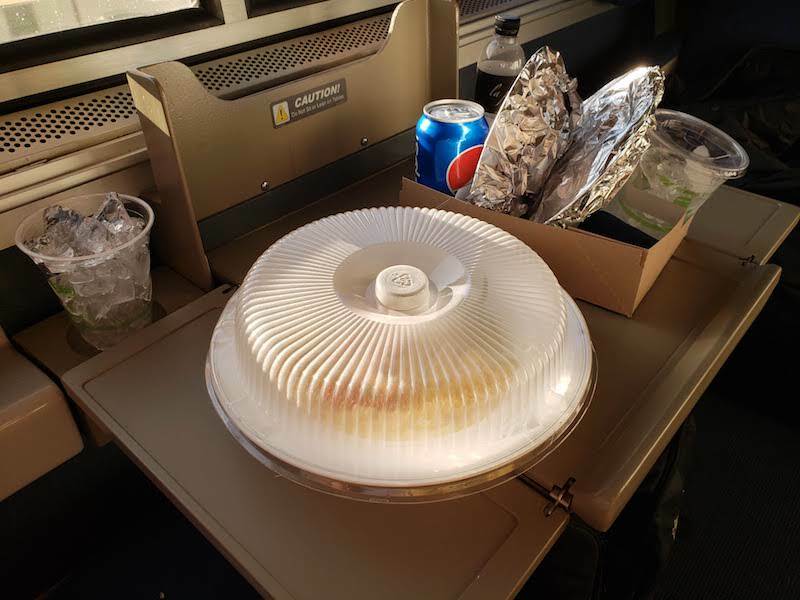 One of the nice things about booking a Room or Roomette on Amtrak is that all your meals are included. 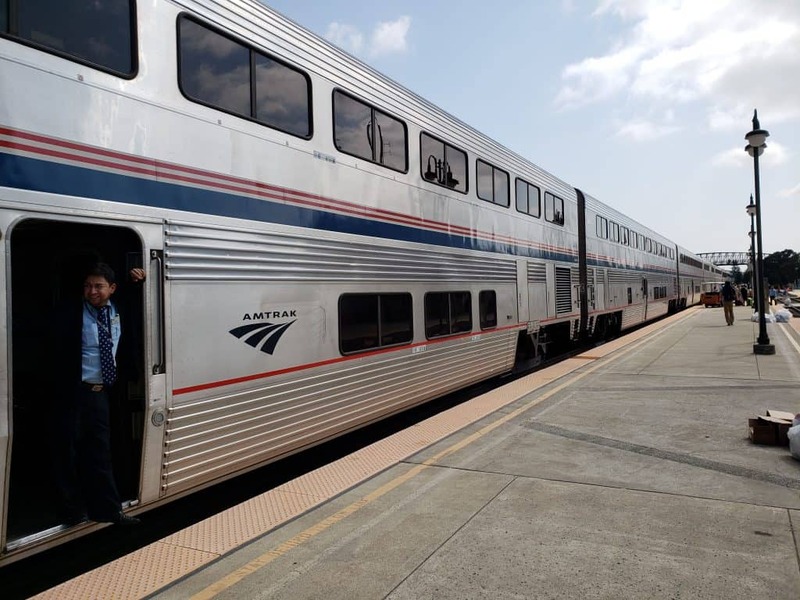 For the Coast Starlight from Los Angeles to Seattle, that works out to five meals (lunch and dinner on Day 1, breakfast, lunch and dinner on Day 2). 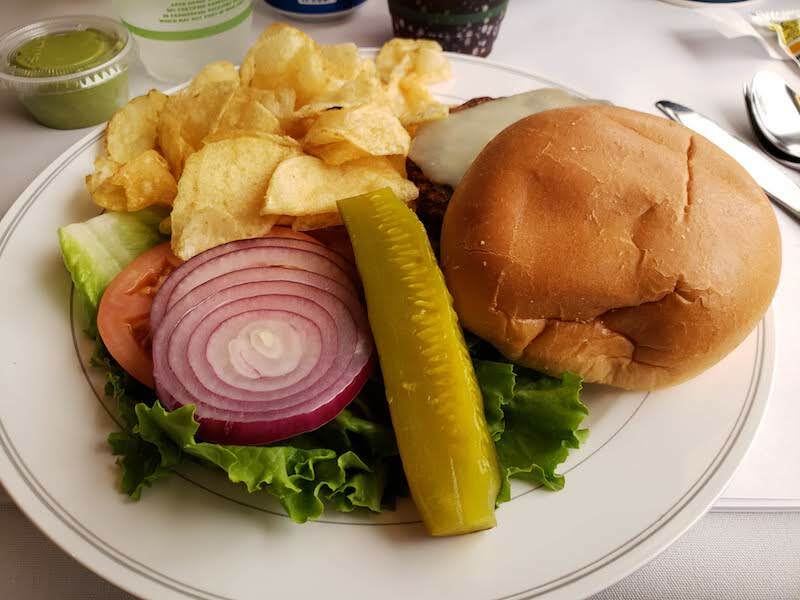 Meals are served in the Dining Car or in your room as arranged by your steward. All courses are included; you only pay for gratuity and alcohol. For reference, I have included the price for the meal if it had not been included. 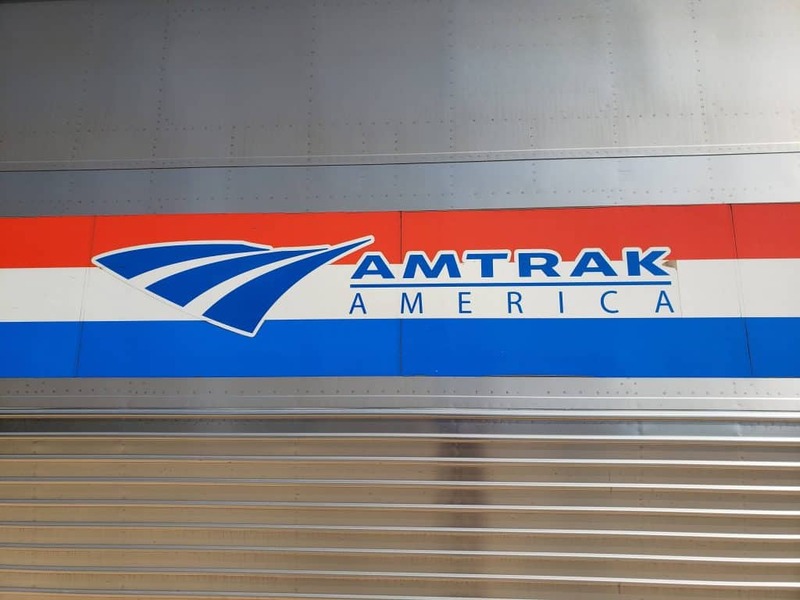 Pretty soon after departing the station in Los Angeles, the Dining Car manager stopped by each room to take meal reservations. She did this before every lunch and dinner. She was quite sassy; reminded more people than just me of the traditional grade school lunch lady. She kept passengers in line in her dining car. Slots for lunch ran from Noon until 2:00pm on the half hour. Dinner reservations ran from 6:00-8:30pm on the first night and 5:00-6:00pm on the second night (due to arrival around 7:30pm in Seattle). I picked a 12:30 lunch time which gave me enough time to get settled a bit before eating. 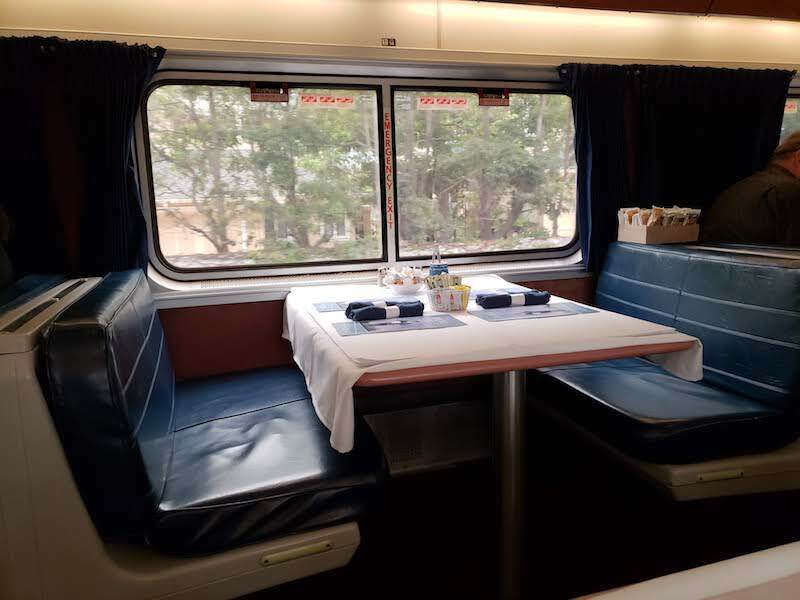 The Dining Car manager seats you when you arrive for your meal. Tables are filled as passengers arrive, and unless you are a party of four, you will be seated with other guests. My first lunch I was seated with a couple from Las Vegas heading up to Seattle. Everyone understands that you will be seated with strangers and most people seem to enjoy getting to know one another. Some of my meals were with people that were more social while other times people kept to themselves. Upon being seated, you are given a form that you add your name, room number and car number to the bottom. The server then uses this to take and track your order. If you are not in a sleeper, you then pay at the end of the meal. Those in sleepers just pay for alcohol and tip (optional but highly encouraged). 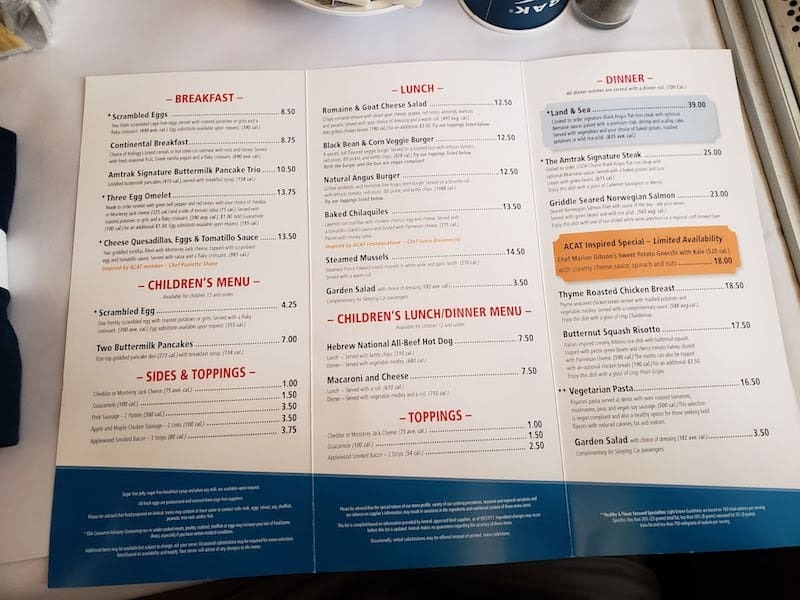 The menu is the same both days. Overall I was pleasantly surprised by the food. 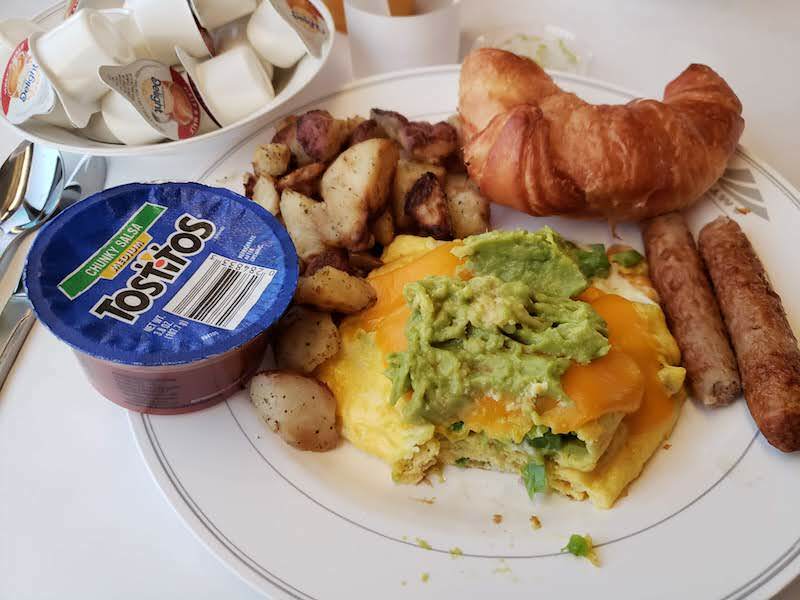 It is definitely a few steps up from airplane food. 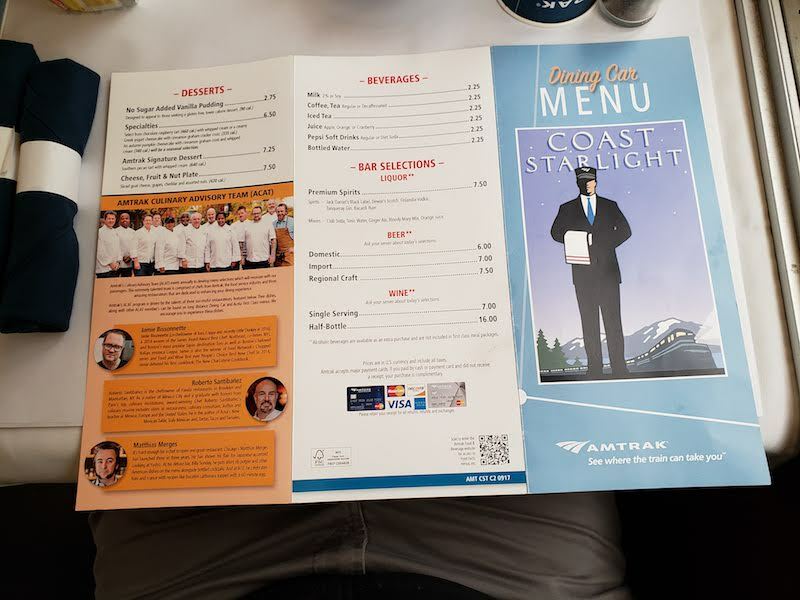 They definitely cook some of the items on the train (I am guessing a lot of the items like salad and desserts are pre-made and then prepped on board). For dinner I was seated with a party of three women traveling for work. They were a lot of fun and the liveliest table of all my meals. I wanted to order the special sweet potato gnocchi, but I was told it had been discontinued. Instead I had the grilled chicken with mashed potatoes, garden salad, and salted caramel parfait for dessert and a Pepsi. ($30.75) I was too distracted by the conversation to get a photo. The next morning I woke up to watch the sunrise over Mt Shasta. 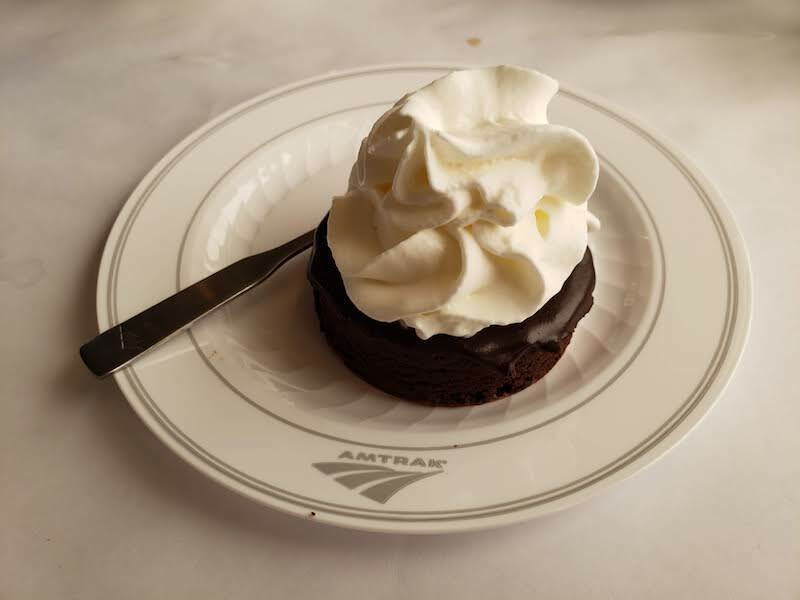 I arrived at the Dining Car shortly after it opened (6:30am) and was seated at a table. Quick two other single riders were seated with me. One was on his way up to see a dying family member; I think he was happy to have someone to talk to. For lunch I made a noon reservation. I was seated with another single rider going home to central Washington and two friends traveling together, one from Austria and one from Spain. They were getting off at Portland and then driving to the Washington coast. 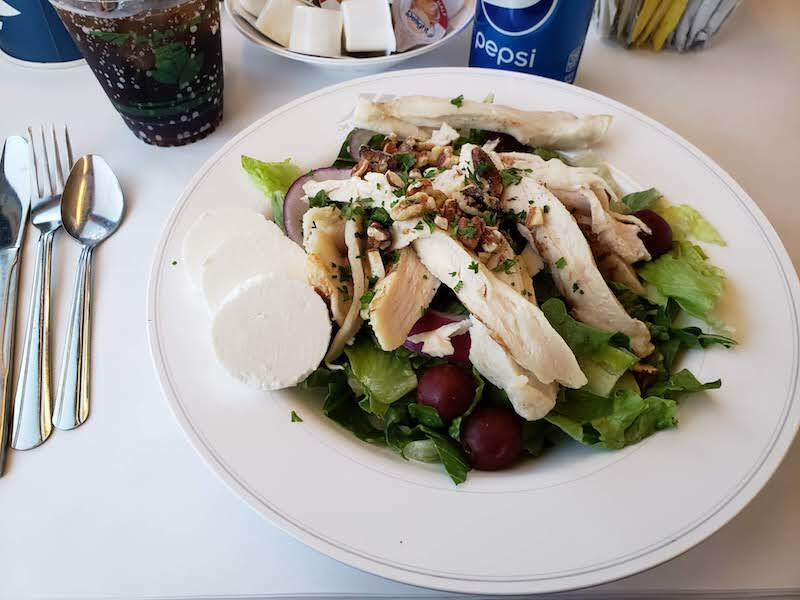 For lunch I ordered the romaine and goat cheese salad with chicken added with a Pepsi and the chocolate cake for dessert. ($24.75) It was probably my favorite meal of the trip. Dinner reservations were only available between 5-6pm due to our arrival in Seattle. 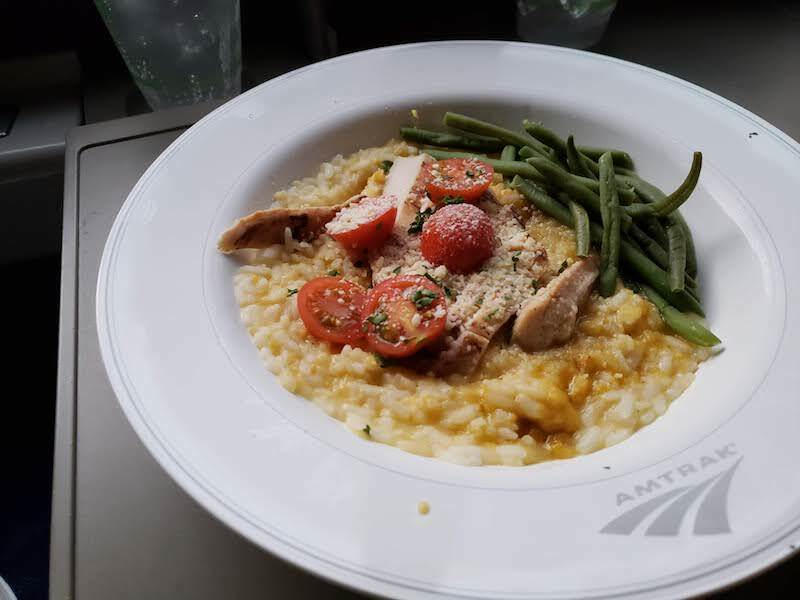 I decided to try out room service for this meal and had the butternut squash risotto with chicken added, a garden salad and the salted caramel parfait with a Pepsi. ($33.25) Another very good meal. The communal dining is fun even for someone that tends to be an introvert. It is just part of the slowed down experience of riding a train. The food is quite good, especially since it is included in the price of the room reservation. Had it not been, my food would have cost $136 plus tip.